As a book of antiquity, the Bible is constantly under scrutiny for Its historical accuracy, and archeology is used as a criterion for determining and evaluating Its trustworthiness and truth. Was Jesus a historical person? Did the stories of His life reflect the conditions of the first century? 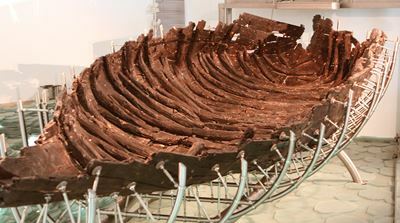 During the drought of 1986, two fishermen discovered a first century boat along the muddy northwestern shore of the Sea of Galilee. The recovery process took 12 days and nights and its preservation required a seven year chemical bath. The dimensions of the boat's remains are in length: 9 meters (29.5 feet), width: 2.5 meters (8.2 feet) and height: 1.25 meters (4 feet). A cooking pot found next to but outside of the boat was dated between the mid-first century B.C to mid-second century A.D. A pottery lamp found within the boat's remains was dated within the same period. Iron nails were also found within the boat's frame. 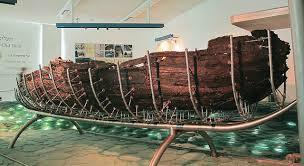 This was the first boat of its kind dated to the first century. 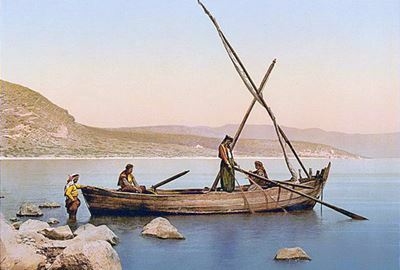 Scholars believe that the boat's size was sufficient to be a fishing or ferry boat, and its design may well be the very type mentioned in the gospels. Close examination of the boat's construction indicated that, prior to the insertion of its frames, the shell of the boat was built with planks that were joined edge to edge with pegged mortise and tenon joints. The frames were attached to the shell with iron nails. This common Mediterranean shipbuilding method was typical for the period 100 B.C. – 200 A.D.
Lebanese cedar and oak frames were common materials; however, this boat had in addition ten other wood species. Archeologists also found wood from ten other species, recycled wood and planks of non-uniform sizes, which may indicate that the boat's owner could not afford the best construction materials. The boat could easily support a square sail amidships and could be rowed with four or five oarsmen. The boat's design does allow for one to sleep in it as well as support the transportation of Jesus and His disciples. The existence of the boat affirms a detail in the gospel narratives adding more support to the historicity of Jesus. The boat is available for study at the Yigal Alon Center at Kibbutz Ginosar on the Sea of Galilee. "Walking on the water is easy to an impulsive pluck, but walking on dry land as a disciple of Jesus Christ is a different thing."